Nico Colombant of Our Town Reno grabs a shot of the indie media panel. 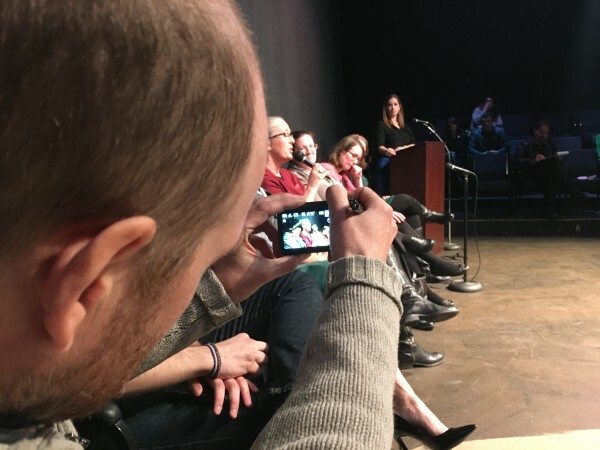 Friday’s first Reno Independent Media Forum collected a wealth of wisdom that featured locally owned and operated news and entertainment media. Present were broadcast, print and digital news sources covering local food, arts and entertainment, local NPR news, Latino-focused news sources and a niche digital outlet focused on covering homelessness. Despite some misconceptions, the effort was to feature Reno-owned and operated enterprises. I wrestled with how far out, regionally, to expand the forum. Potentially dozens of outlets could have been featured from just Reno alone. Also a misconception, as I noted in my introduction: Most of what is consumed in the Reno market is owned by out-of-state corporations. This effort was to focus on those whose media are local and whose ad dollars stay in the local economy. After advertising expenses and the facility fees, the event raised $350 for two local non-profit organizations: Urban Roots and Immunize Nevada. My slightly edited introduction is below. Thanks to all who attended and made this happen. I’m Bob Conrad, who helped organize this event. A few remarks before we get started: The idea behind this forum is to shine a light on Reno’s locally owned and operated media sources. Much of the information we consume in this market is in fact from sources owned by out-of-state corporations. Wouldn’t it be neat to highlight the locals? We talk about supporting local businesses — shop local, eat locally grown food and so on — but there is rarely an open conversation about consuming and supporting local media sources. Imagine if you will the potential impact to the local economy if “advertise local” was a common refrain. Rather than sending hundreds of thousands of dollars to a Midwest or East Coast corporation whose CEO makes millions a year, what if even a fraction of those resources were kept local? Why Reno-based media? In fact, this forum could have expanded beyond Reno to include very worthy operations like the family owned Ruby Radio Network of Elko County, or CarsonNow.org or Carson Valley Times. Even trying to identify Reno’s media sources was a bit daunting. About 20 different outlets were invited and many did not respond, which is fine because the folks you see before you today are incredibly talented, hard working and represent both entrepreneurial and educational media efforts that, combined, help to tell Reno’s story. A few shout-outs: Amanda Burden (Edible Reno-Tahoe) and Lynette Bellin (Reno Moms Blog) have been helpful and supportive in developing the idea for this forum for nearly a year now. They also helped to identify who should be invited to present today. Contrary to one allegation, political affiliation was not a criteria — only place of ownership and operation. Dana Nollsch, the ThisisReno arts reporter, photographer and videographer is filming and shooting today’s event. Lastly, the Reno Little Theater was very gracious and welcoming. Thank you to Melissa and Chad for their support. Please give them a round of applause. Our moderator today is the marketing and communications manager for the Ronald McDonald House Charities of Northern Nevada. She moderated a panel I was on a year ago and did a fantastic job, and she graciously volunteered to be here today. Please welcome Rachel Gattuso. Thank you!